Dissociation is one of the two major schemes of argumentation proposed by Chaim Perelman and Lucie Olbrechts-Tyteca. While association has already been scrutinized through analysis of such aspects as causal and analogical arguments, in-depth investigation into the nature of dissociation has been limited to work done by M. A. van Rees and this author. This article examines issues in conceptualizing and evaluating dissociation. More specifically, it proposes that Trudy Govier’s notion of “logical core” helps to both elucidate the conception of, and evaluate the adequacy of conceptual differentiation in regards to dissociation. Building on this foundation, this paper will attempt to address several issues surrounding dissociation. Section 2 of this article briefly outlines the notion of dissociation. Section 3 clarifies the concept of the “logical core” and theorizes that it helps to evaluate dissociation. Section 4 presents and responds to various implications. Section 5 offers conclusions and recommendations for further research. 1. X is accepted as a single entity. 2. X, assumed to be a single entity, is actually subdivided into two value-laden entities. 2.1 X is divided into two entities (X/XII and XI), based on criteria for differentiation. 2.2 The subdivided X (X/XII and XI) is placed in a hierarchy according to the value embedded in the criteria for differentiation. 3. Although X is believed to be a unified entity, it can be divided into X/XII and XI, with one being more important than the other (from 1, 2)[i]. Critical questions usually accompany an argumentation scheme. The fact that the following critical questions arise from the concept of dissociation is a strong sign that dissociation is not merely a technique used in argumentation, but a product of the practice of argumentation. 1. Is the original X generally accepted as a single entity? 2. Is the conceptual distinction between the two subdivided entities clear? In other words, do the criteria for differentiation form a conceptual distinction? 3. Is the value hierarchy which is set up among the subdivided entities tenable? 4. According to the value hierarchy, is one subcomponent more important than the other? The above scheme and critical questions give rise to three discussion points. Firstly, both the conception of dissociation and the critical questions refute the line of reasoning which claims that dissociation is not an argumentation scheme. Bart Garssen, as quoted by Rob Grootendorst (1999, p. 288), states that dissociation is neither a scheme of argument nor a specific type of argumentation, since acceptance of the premise does not increase adherence to a conclusion, but rather ends in its denial[ii]. Since his position denies that dissociation is a scheme of argumentation, it requires some consideration. One premise of dissociation, however, is that X is accepted as a unified entity, as offered in (1)-1 above. Additionally, the conclusion of dissociation is that although X is believed to be a unified entity, it can be divided into the less important XI and the more important X/XII, as seen in (1)-3. With an although clause in the conclusion of a dissociation, the acceptance of the above premise (1)-1 helps the audience adhere to that conclusion. A conclusion with an although clause, as shown in (1)-3, requires the acceptance of X as a single entity in its premise. Without an although clause, however, the acceptance of X as a single entity is irrelevant to the conclusion, since its acceptance does not promote adherence to the conclusion, as Garssen rightly claims. As a result, the although clause is without support, and the dissociation will be logically weak. This reconceptualization of dissociation denies Garssens’s position that dissociation is not a scheme of argumentation, and thus the presumption strongly favors the notion that dissociation is a scheme of argumentation. In light of this reconceptualization, scholars taking the position that dissociation is merely a technique of argumentation must first conceptualize ‘technique’ and advance a different line of support for why dissociation is a technique of argumentation. Secondly, dissociation, like causal reasoning and analogy, can serve as a type of reasoning for use in argument. In other words, an arguer can offer a value-laden, conceptual distinction without actually making an argument. Ralph H. Johnson (2003), for example, questioned whether my previous article had wrongly regarded Johnson and Blair’s article (1980/1996) as an extended argument, without criticizing my main claim that they had used dissociation to differentiate informal logic from formal deductive logic and standard inductive logic. If Johnson is correct and I was examining dissociative reasoning rather than dissociative arguments, my article may have unfairly evaluated the dissociation they offered. The lesson to be learned is that the type of discourse must be determined before the dissociation can be evaluated appropriately. This is because if we treat non-argumentative discourse as argument, we will probably fail to evaluate the discourse fairly. Finally, although dissociation is presented here as a scheme of argument or reasoning for subdividing a single entity into two, this does not exclude the possibility of dividing it into three or more. We can conceptually classify the world, for example, into ‘apparent’, ‘ real’, and ‘surreal’ worlds; if we succeed in this attempt, then the dissociation has, in fact, functioned to subdivide a single entity into three[iii]. Although these are key issues meriting further investigation, this article does not directly inquire into them, being limited to conceptual differentiation in dissociation. 1. The analogue has features a, b, and c.
2. The primary subject has features a, b, and c.
3. It is by virtue of features a, b, and c that the analogue is properly classified as a W.
In this scheme, the two cases (the primary subject and the analogue) have a common structure; both have features a, b, and c. These two cases, therefore, share a logical core. Although they may differ in some respects, their shared logical core negates actual and potential dissimilarities, giving us license to treat the two in the same way. It is important to note that Govier does not subscribe to the belief that logical core is a form of argument. The logical core shared by two cases is not comprised of such standard logical terms as ‘and’, ‘or’, ‘all’, ‘no’, ‘some’, or ‘if… then’, but of seemingly non-logical terms, for example: “‘survives in’, ‘acceptable for’, ‘temperamentally mismatched’, ‘has not definitive method of proof’, and so on” (Govier 1987, p.213). If the two cases feature a common core quality, the arguer can conclude that the two are fundamentally the same. This situation suggests that a logical core cannot easily be put into logical form, but is embedded in language as it is naturally generated. By extension, examination of the logical core requires an awareness of the subtleties inherent in natural language. As described in section 2, dissociation establishes a conceptual subdivision in what is otherwise regarded as a single entity. In the process of conceptual distinction, a dissociation must make a clear distinction, as stated in critical question (2)-2: Is the conceptual distinction between the two subdivided entities clear? In other words, do the criteria for differentiation actually make a conceptual distinction? The notion of logical core plays a crucial role in examining this conceptual distinction. The previous section has shown that the logical core in an a priori analogy helps us detect key similarities between two entities. If entities share a logical core, then they are analogous to each other; an arguer can then conclude that the entities can be regarded as being the same. In contrast, logical core plays the opposite role in dissociation. If two subdivided entities (X/XII and XI) do not share a logical core, then they are dissimilar, and an arguer can set up a conceptually clear distinction, regardless of other features common to both entities. While XI, one subdivided component in a dissociation, does not have feature a, X/XII, the other component does. The fact that XI and X/XII do not share a logical core (feature a) gives us license to conclude that they are classified differently. Since logical core must, by definition, be preserved to demonstrate critical similarities, two things not sharing a logical core are fundamentally different. In other words, logical core in a priori analogy demonstrates critical similarities; logical core in dissociation, on the other hand, demonstrates critical dissimilarity. Since logical core plays opposite functions in a priori analogy and dissociation, the functions of a priori analogy and dissociation are contrastive; the former emphasizes critical similarities between two entities, while the latter emphasizes their critical dissimilarities. Additionally, the former advances a claim that two different cases are actually a single case, whereas the latter claims that a single entity is actually two different ones. 2.1 X is divided into two entities (X/XII and XI), with XI not having the logical core (feature a) and X/XII having it. I have been assuming throughout that the principal content of what is so often called “informal logic” is the fallacies…; and of course a theory of argument that is sensitive to all this complexity. If this has been a tolerable assumption, then I have an answer to the question with which we began, “What is Informal Logic?” Nothing is. The theory of the fallacies is not logic, though it includes some logic, indeed quite a bit of logic; and the theory of the fallacies is not only at its best as a formal theory, it is difficult to see how the suppression of its formal character could leave a residue fully deserving the name of theory. Here Woods states that the main content of what is often called informal logic is “the fallacies.” He asks the readers to accept this view as the starting point of his dissociation for the sake of argument, qualifying it with, “if this has been a tolerable assumption.” He then attempts to deny the existence of informal logic in this sense, asserting that fallacy-theory is not logic. In the second paragraph, he introduces a new conception of informal logic: workaday logic, prior to any axiomatic treatment. While denying informal logic in the first sense, Woods accepts informal logic in the second sense. He is ascribing two different logical cores to the single term ‘informal logic’: fallacy-theory and workaday logic. If these two have no bearing upon each other, then we can conclude that because the two senses of informal logic are different, the conceptual differentiation offered by Woods is clear. In this passage, Scriven states that the emergence of informal logic means the end of formal logic. He then ascribes certain properties to formal logic, for example logical words such as “if and only if,” “any,” “most,” and “all.” In this passage, the conception from which he dissociates formal logic and informal logic is not stated. At first glance, either logic or formal logic seems to serve as the starting point of this dissociation[v]. Whichever is the case, suffice it to say that the rise of informal logic is closely connected to the end of formal logic. On the next page, he ascribes a second set of features to informal logic. Scriven states that the logical foundations of informal logic include the fallacy of psychologism, circularity, the genetic fallacy, and the deductive/inductive distinction. These properties constitute the logical core of informal logic. If the properties of formal and informal logic do not overlap, then the conceptual distinction between them is clear. Although the starting point of this dissociation is not specified, it is clear that formal and informal logic are the two entities dissociated from the original entity. In this passage, Johnson and Blair attempt to specify the starting point of dissociation: logic. Also, they describe the historical background of the conception of logic, at one time virtually equal to the conception of formal logic. This idea of formal logic as equivalent to logic is the conception requiring dissociation here. Johnson and Blair then advance the argument that informal logic is, in fact, distinct from formal logic. The phrase “alongside formal logic” suggests that the writers believe that informal logic can enjoy equal status with formal logic, as another branch of logic. As a result, formal logic is no longer equivalent to logic, but reduced to branch status. Although specific key features have not yet been ascribed to formal or informal logic in this passage, there is a clear attempt to differentiate informal and formal logic from logic. Immediately after, however, the writers begin ascribing certain properties to informal logic. By ‘the theory of argument’ … we mean the attempt to formulate a clear notion of the nature of argument which is not beholden to formal logical or proof-theoretic models, and to develop principles of criticism and reasoning which come closer to shedding light on natural argumentation than do those of formal logic. (Johnson and Blair, p. 10). Johnson and Blare are now contrasting key features of informal logic and formal logic: informal logic deals with the nature of argument and principles of criticism, whereas formal logic deals with the nature of argument, based on formal logical or proof-theoretic models. In examples (8)-(11), if the ideas of logic and formal logic as logic are acceptable, the starting point of the dissociation has been clearly set. Moreover, if the nature of argument based on formal logical or proof-theoretic models is a feature of formal logic, and if the nature of argument not based on formal logical or proof-theoretic models is a feature of informal logic, then the advanced conceptual differentiation has been clarified. With the relationships between logical core and dissociation firmly set, implications of two important issues can be addressed. The first is to determine which perspective better handles dissociation: the dialectical, or the logical. The second is whether dissociation qualifies as an overarching scheme of argumentation, as association does. 1. The procedural rules are followed, and the dissociation clearly subdivides an entity into two. 2. The procedural rules are followed, but the dissociation does not clearly subdivide an entity into two. 3. The procedural rules are not followed, but the dissociation clearly subdivides an entity into two. 4. The procedural rules are not followed, and the dissociation does not clearly subdivide an entity into two. Since dialectical perspectives focusing on procedural rules and logical perspectives focusing on the quality of product in argumentative exchange form the same judgments in scenarios 1 and 4, these two scenarios are not of interest here. Scenarios 2 and 3, however, merit consideration. Suppose that an interlocutor accepted the conceptual distinction offered by Scriven or Johnson and Blair, but the distinction did not clearly differentiate between informal logic and formal logic (scenario 2). Alternatively, suppose that the interlocutor disregarded the conceptual distinction offered by these writers, but the distinctions were clear enough to differentiate between informal logic and formal logic (scenario 3). In the former scenario, the dialectical perspective would force us to judge the dissociation as clear; in the latter scenario, it would force us to judge the dissociation as unclear. On the other hand, the logical perspective would force us to reach an entirely opposite judgment for these two scenarios. In other words, neither dialectical nor logical perspectives would help us make a satisfactory judgment. In a case where judgment of a dissociation requires scholarly knowledge, however, depending entirely on the dialectical perspective is more problematic than depending solely on the logical perspective that focuses on the logical perspective. This is because the conceptions dealt with in the dissociation are vital to advancing the scholarship of that particular field of inquiry. This may or may not apply to every type of dissociation; nonetheless, dissociation offered in a scholarly setting can be evaluated more adequately by the product standard, since scrutinizing the content of the subdivided conceptions requires substantial background knowledge. Reconceptualizing dissociation based on logical core helps clarify the nature of dissociation. In this approach, dissociation is regarded as disanalogy. Dissociation as disanalogy, however, can qualify either as an overarching conception of dissociation or merely a specific sub-type of dissociation. This article has assumed disanalogy to be a general characteristic. If this is the case, a list of sub-types of dissociation should be compiled, offering conceptual and normative accounts of each. On the other hand, if dissociation as disanalogy is a specific example of dissociation, this article has treated conception and evaluation of a sub-type of dissociation, but failed to give a general account of dissociation. In this case, future research should focus on a general account of dissociation and compiling a list of other sub-types of dissociation. Whichever the case, inquiries into other sub-types of dissociation must be undertaken in the future. In this article, I have drawn on Govier’s work on a priori analogy to shed light on how dissociation is conceptualized and evaluated. Logical core and key features common to two entities help an arguer advance a cogent a priori analogy. Likewise, logical core helps an arguer clarify a conceptual distinction at the starting point of a dissociation, therefore, scrutinizing the logical core helps evaluate the adequacy of a dissociation. Since this may require background knowledge of the dissociation, evaluating adequacy of dissociation is more cognitive or substantive than procedural. As such, the informal logical perspective is better suited to this purpose, particularly when a dissociation is made in scholarly discourse. The reconceptualization of dissociation offered in this paper has also demonstrated that acceptance of a premise increases the audience’s adherence to its conclusion. This presumption, in turn, favors the view that dissociation is a scheme, or product of argumentation. Topics that merit further investigation into dissociation include (1) compilation and classification of sub-types of dissociation and (2) evaluation of value hierarchy embedded in dissociation. These two topics comprise the research to-do list the author compiled previously (2002, p. 640). This article has drawn on logical core to examine dissociation, but it is not certain if logical core always emerges in dissociation. Whether or not this is the case, work needs to be done on classifying dissociation. Moreover, since this article has focused only on the issue of conceptual distinction, value hierarchy embedded in dissociation will hopefully inspire investigation by those in the field of argumentation. [i] Perelman and Olbrechts-Tyteca emphasized use of ‘philosophical pairs’ in dissociation, such as appearance and reality, the whole and the part, and the infinite and the finite. In contrast, M.A. van Rees claimed that even when the pair is not in use, people advance a dissociation. In this case, X is divided into X and XI, not XI and XII. The author agrees with this view and has modified his conceptualization of dissociation since his previous work (2002, 2003). [ii] The author’s previous work (2002) summarizes the criticisms that Grootendorst listed and weighs the strength of each. Garssen’s point is taken up here, and Schellens’ point in section 4, since they are the strongest arguments and merit the most discussion. [iii] Marcello Guarini (2004, p. 167) makes a similar point when he discusses analogy, stating that an arguer can compare three things when offering an analogy. [iv] The article by Johnson and Blair is quoted from Rise of Informal Logic because of easier availability of the source material. [v] Since the starting point is not clearly specified, there are issues of hidden premises involved here. Another possibility is that the conceptual distinction offered here may not be part of a dissociation, but of something else. [vi] As stated in section 2 of this article, the article mentioned may not be an extended argument in its totality. However, the point quoted here is, in fact, an example of dissociation. Govier, T. (1987). Problems in Argument Analysis and Evaluation. Dordrecht, The Netherlands: Foris. Govier, T. (2001). A Practical Study of Argument (5th.ed.) Belmont, CA: Wadsworth. Grootendorst, R. (1999). Innocence by Dissociation. A Pragma-Dialectic Analysis of the Fallacy of Incorrect Dissociation in the Vatican Document ‘We Remember: A Reflection on the Shoah’. In F.H. van Eemeren, R. Grootendorst, J.A. Blair, and Ch.A. Willard (Eds. ), Proceedings of the Fourth International Conference of the International Society for the Study of Argumentation, (pp. 286-289). Amsterdam: Sic Sat. Guarini, M. (2004). A Defence of Non-Deductive Reconstruction of Analogical Argument. Informal Logic. 24.2. 153-168. Johnson, R. H. (May 21, 2003). Personal Communication. Konishi, T. (2002). Dissociation and its Relation to Theory of Argument. In F. H. van Eemeren, J. A. Blair, C. A. Willard, & F. S. Henkemans. (Eds. ), Proceedings of the Fifth International Conference on Argumentation. (pp. 627-640). Amsterdam, The Netherlands: Sic Sat. pp. 637-640. Konishi, T. (2003). Establishing Informal Logic through Dissociation. In J. A. Blair, D. Farr, H. V. Hansen, R. H. Johnson, & C. W. Tindale. (Eds. ), Informal logic at 25: Proceedings of the Windsor conference. (CD-ROM). Windsor, Ontario, Canada: OSSA. Rees, M. A. van. (2005). Dialectical Soundness of Dissociation. In. D. Hitchcock & D. Farr (Eds. ), Uses of Argument: Proceedings of a Conference at McMaster University (pp. 383-392), Canada: OSSA. Scriven, M. (1980). The Philosophical and Pragmatic Significance of Informal Logic. In In J. A. Blair and R. H. Johnson. (Eds. ), Informal Logic: The First International Symposium. (pp. 147-160, Ch. 9), Inverness, CA: Edgepress. Woods, J. (1980). What is Informal Logic. In J. A. Blair and R. H. Johnson. (Eds. ), Informal Logic: The First International Symposium. (pp. 57-68, Ch. 4), Inverness, CA: Edgepress. ISSA Proceedings 2002 – Is There An Argument For This Audience? ISSA Proceedings 2014 ~ Argumentative Strategies In Adolescents’ School Writing. 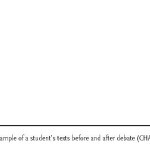 One Aspect Of The Evaluation Of Students’ Written Argumentative Competence.